The Victorinox 10.25-Inch Serrated Bread Knife not only slices through the thickest artisan breads like butter, it also excels at slicing tomatoes, sandwiches, large cuts of meat, round cakes and sticky buns. It's sharp and stays that way with proper use and care. Cuts through bread like butter. Experts and owners say the Victorinox 10.25-Inch Serrated Bread Knife is a one-cut performer, slicing easily through even the largest, crustiest loaves of artisan or homemade bread. It's a good all-purpose knife as well, they note, slicing tomatoes, meats and watermelons and horizontally sectioning cakes with virtually no additional effort required. It comes sharp and stays sharp for years. Users and professional testers say it's well-balanced and comfortable to hold. The 10-1/4-inch size is said to be the perfect choice, not so small that it requires "sawing" or a second stroke, yet not so large that the end catches on the cutting board. 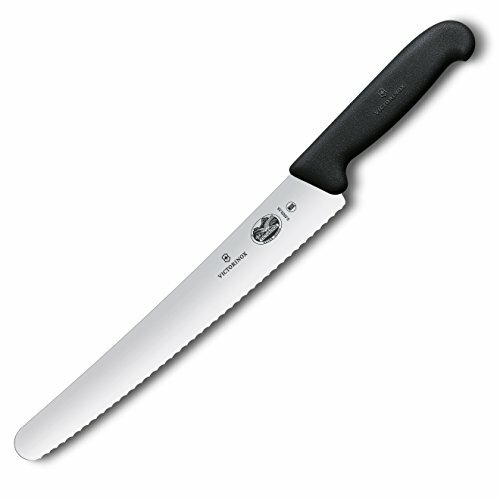 If you have smaller hands, though, this Victorinox knife also comes in an 8-inch size (Est. $30). Lightweight, yet sturdy. 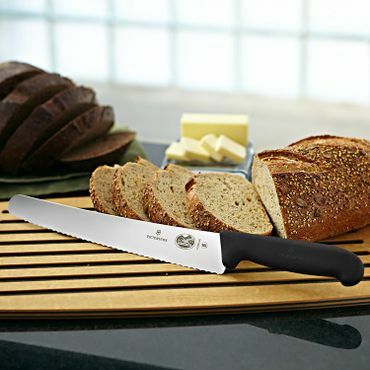 In testing, the Victorinox 10.25-Inch Serrated Bread Knife is found to be lightweight, yet well-balanced, reducing fatigue if you have a lot of kitchen prep to do. The handle is made from Victorinox's proprietary "Fibrox," which experts and owners agree provides a comfortable, yet secure, grip. The manufacturer recommends hand washing. We read no reports of this knife dulling, even after years, but, for the price, if it does seem to lose its edge, buying another one is a no-brainer. Victorinox knives come with a lifetime warranty.